A new poetic form each week. Let's see how this goes. You again and again: let me rest, at last still. Myself again, again, let me rest, at last still. Metric verse isn’t something I’ve never really done a lot of. Mostly because it’s hard and it’s a skillset that you can easily get by without. Not that you necessarily should get by without it, but it’s possible. I decided to go with a Spenserian stanza as a way to try out alexandrines, since they seem – at least in English – to be used mostly as a light seasoning line in with the bread-and-butter of iambic pentameter. This also prompted me to actually read some of The Faerie Queen, which is awesomely violent and weird (at least as far as I’ve read) and not all the dull discourse on virtue that Spenser makes it out to be in his introduction. I was reading up on alexandrines and thinking about appropriate subject matter. There’s aslowness to the alexandrine, a pausing (especially with the caesura). It’s also, through Racine in French and Milton and Shakespeare in English, associated with tragedy. I settled on writing about Tarkovsky’s Solaris, particularly the zero gravity scene in the library. I’ve always found that scene very moving, very tragic in ways I’ve found difficult to articulate, so the poem here is my effort to work some of that into words. The scene itself is, like, the alexandrine, a slowing and a pausing within the film itself – a space that exists, quite literally, without the pressures of Earth. The character of Hari also works well with the Spenserian stanza, given all of the characters who magically take on the appearance of others. A bit of weird mishmash of stuff going on here, then, but it was fun to play around with and it’s always good to have a reason to rewatch Solaris. At Hiruharama, I did not visit your grave. Not the drama of your head-long penance but simply home. At Jerusalem, I did not visit your grave. You beating at the door I never even tried to open. That I was busy living and you were dead. Reading your words half a world away. What I like about them, as a form of constrained writing, is precisely that they do disappear – that they form an invisible backbone to the poem, supporting and determining its shape. It not surprising, then, that two of examples cited in the Wikipedia article [relinky here] are devotional poems. This mechanic also works for the way that writers who influence us are folded silently into our own work. As such, I chose to use a quote from James K. Baxter, a poet who a read a lot when I was younger, as the acrostic here. The quote, “a madman, a nobody, a raconteur,” comes from the first of Baxter’s Jerusalem Sonnets, Baxter speculating on how his Catholic God sees him. 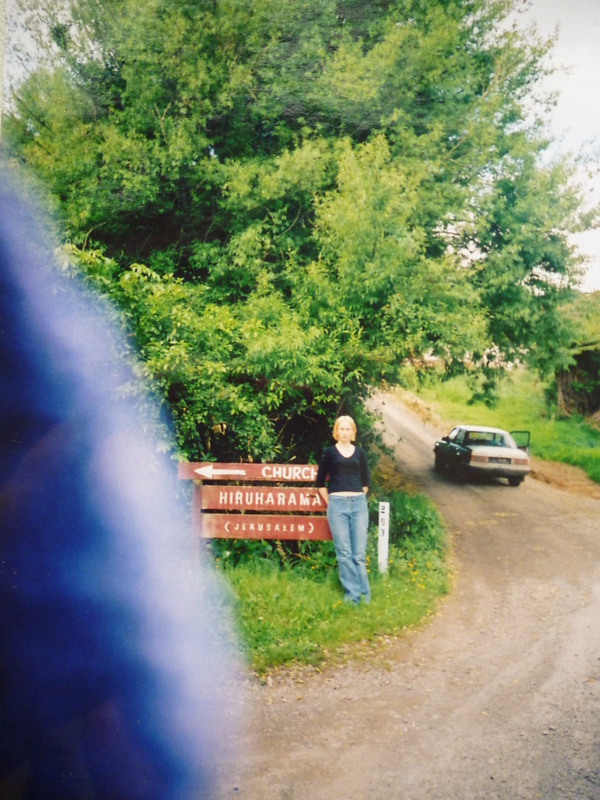 Here’s a photo of me at Hiruharama, on a road trip I took with my sister, when I did not visit Baxter’s grave. Judging by the unfortunate hair, I think I would have been 17 or 18. Coats of crowds, cocooned closely against the cold. Glass, glowing with grapeshot gleams. Although there are lots of ways to do an alphabetical form, I settled on this because I thought 26 lines would be manageable and because it gives me a chance to double up with alliterative verse. Alliterative verse is so much fun and sadly neglected now. Of course, doubling up with alliterative verse made the form much harder – but that’s the fun of formal poetry, right? Contrary to expectation, I actually found the weird letters (Q, X, Z) easier than the more common ones – having fewer options made it clearer where those lines needed to go. I used Chicago as my subject because I was there last week. I don’t think my poem does anything close to living up to its title, but I do like the idea of a list-like, discontinuous form like this for such a huge and sprawling subject. As I was writing, I found myself shifting towards a more impressionistic, sound-based mode of writing – extended images or conceits (or even proper sentences and grammar) were just too hard for me. This reminded me of George Starbuck’s style, which I think I ended up imitating here. I’m wondering now, having written this poem, if some of Starbuck’s terrifically fun, free-wheeling manner was developed out of his work with very involved formal poetry.